Anemia is a deficiency of oxygen-carrying capacity of blood, typically caused by lack of iron and/or certain vitamins. Iron is required for the formation of hemoglobin, and folic acid and B12 support normal blood cell maturation in the bone marrow. Vitamin C and betaine HCl enhance iron absorption, and vitamin A facilitates mobilization of iron from storage sites. Copper is essential to normal transport of iron through the circulatory system. Manganese is included to offset reduced manganese absorption during iron therapy. 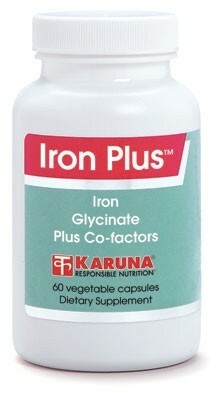 Only Iron Plus provides supplemental iron in a patient-friendly form, along with all the essential supportive nutrients. Iron deficiency anemia is the most common specific nutritional problem in the world, affecting many menstruating women (JAMA 1997; 277:973-6). Reduced tissue iron can influence not only red blood cell formation, but immune defenses (Blood 1986; 68:803-9) and even brain function (Lancet 1996;348:992-96). Glycine-based iron supplements are better tolerated and more effective than ferrous sulfate (Nutrition 2001; 17:381-4; J Appl Nutr 1994;46:2-11). Anemias can result from inadequate intake or absorption of either dietary folate or vitamin B12 (Annu Rev Nutr 1999;19:357-377; Am Fam Physician 1999;59:1598-604). Vitamin A performs several important roles in iron utilization and blood cell development (Eur J Clin Nutr 2002;56:271-81). 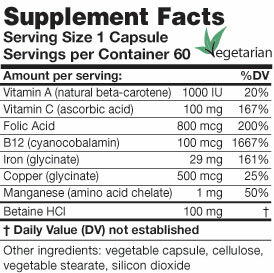 Vitamin C enhances the absorption of iron from non-heme sources (Ann Nutr Metab 1990;34:32-6). Copper deficiency can lead to anemias that are easily mistaken for iron-deficiency anemia, (Am J Clin Pathol 1992;97:665-8) and copper absorption may be reduced with high iron intakes (J Pediatr Gastroenterol Nutr 1986;5:768-73). High iron intake can reduce manganese levels in the body (Am J Clin Nutr 1992;55:747-752). Suggested use for adults: Should be taken only as directed. Recommended dosage is one capsule daily, on a full stomach. WARNING: Accidental overdose of iron-containing products is a leading cause of fatal poisoning in children under 6. Keep this product out of the reach of children. In case of accidental overdose, call a doctor immediately.